High-accuracy subcontract thread grinding, in small batches or as single components, forms an increasing portion of the workload for GB Precision - which is why the company has invested in three high-specification Studer CNC grinding machines. GB Precision can machine internal and external, standard and non-standard profiles. External thread grinding is possible up to 250mm diameter with pitches down to 0.3mm, Unified 60 degree, ISO Metric 60 degree (both with any thread and pitch), Whitworth, Acme and Aero MJ threads and other thread specifications to suit customers’ specific requirements are available. This level of flexibility is ideal for machining threads for example in mould tools, where non-standard thread dimensions need to specified to include shrinkage allowances. 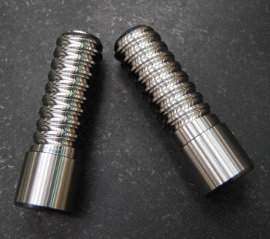 Depending on customers’ requirements GB Precision can either machine the whole item, including the thread grinding features, or add the thread grinding to the pre-machined part. In some instances, customers “rough-in” the thread geometry before sending the component, which GB Precision then precision grinds to completion.